This article is about the Chinese philosopher. For his eponymous text, see Zhuangzi (book). 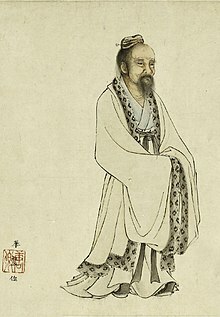 Zhuang Zhou (/dʒuˈɑːŋ ˈdʒoʊ/), commonly known as Zhuangzi (/ˈʒwæŋˈziː/; Chinese: 莊子; literally "Master Zhuang"; also rendered as Chuang Tzu[a]), was an influential Chinese philosopher who lived around the 4th century BC during the Warring States period, a period corresponding to the summit of Chinese philosophy, the Hundred Schools of Thought. He is credited with writing—in part or in whole—a work known by his name, the Zhuangzi, which is one of the foundational texts of Taoism. Chuang-Tze had made himself well acquainted with all the literature of his time, but preferred the views of Lao-Tze; and ranked himself among his followers, so that of the more than ten myriads of characters contained in his published writings the greater part are occupied with metaphorical illustrations of Lao's doctrines. He made "The Old Fisherman," "The Robber Chih," and "The Cutting open Satchels," to satirize and expose the disciples of Confucius, and clearly exhibit the sentiments of Lao. Such names and characters as "Wei-lei Hsu" and "Khang-sang Tze" are fictitious, and the pieces where they occur are not to be understood as narratives of real events. But Chuang was an admirable writer and skillful composer, and by his instances and truthful descriptions hit and exposed the Mohists and Literati. The ablest scholars of his day could not escape his satire nor reply to it, while he allowed and enjoyed himself with his sparkling, dashing style; and thus it was that the greatest men, even kings and princes, could not use him for their purposes. King Wei of Chu, having heard of the ability of Chuang Chau, sent messengers with large gifts to bring him to his court, and promising also that he would make him his chief minister. Chuang-Tze, however, only laughed and said to them, "A thousand ounces of silver are a great gain to me; and to be a high noble and minister is a most honorable position. But have you not seen the victim-ox for the border sacrifice? It is carefully fed for several years, and robed with rich embroidery that it may be fit to enter the Grand Temple. When the time comes for it to do so, it would prefer to be a little pig, but it can not get to be so. Go away quickly, and do not soil me with your presence. I had rather amuse and enjoy myself in the midst of a filthy ditch than be subject to the rules and restrictions in the court of a sovereign. I have determined never to take office, but prefer the enjoyment of my own free will." According to modern understandings of Chinese tradition, the text known as the Chuang-tzu was the production of a 'Taoist' thinker of ancient China named Chuang Chou/Zhuang Zhou. In reality, it was nothing of the sort. The Chuang-tzu known to us today was the production of a thinker of the third century CE named Kuo Hsiang. Though Kuo was long called merely a 'commentator,' he was in reality much more: he arranged the texts and compiled the present 33-chapter edition. Regarding the identity of the original person named Chuang Chou/Zhuangzi, there is no reliable historical data at all. However, Sima Qian's biography of Zhuangzi pre-dates Guo Xiang (Kuo Hsiang) by centuries. Furthermore, the Han Shu "Yiwenzhi" (Monograph on literature) lists a text Zhuangzi, showing that a text with this title existed no later than the early 1st century AD, again pre-dating Guo Xiang by centuries. Zhuangzi is traditionally credited as the author of at least part of the work bearing his name, the Zhuangzi. This work, in its current shape consisting of 33 chapters, is traditionally divided into three parts: the first, known as the "Inner Chapters", consists of the first seven chapters; the second, known as the "Outer Chapters", consist of the next 15 chapters; the last, known as the "Mixed Chapters", consist of the remaining 11 chapters. The meaning of these three names is disputed: according to Guo Xiang, the "Inner Chapters" were written by Zhuangzi, the "Outer Chapters" written by his disciples, and the "Mixed Chapters" by other hands; the other interpretation is that the names refer to the origin of the titles of the chapters—the "Inner Chapters" take their titles from phrases inside the chapter, the "Outer Chapters" from the opening words of the chapters, and the "Mixed Chapters" from a mixture of these two sources. Further study of the text does not provide a clear choice between these alternatives. On the one side, as Martin Palmer points out in the introduction to his translation, two of the three chapters Sima Qian cited in his biography of Zhuangzi, come from the "Outer Chapters" and the third from the "Mixed Chapters". "Neither of these are allowed as authentic Chuang Tzu chapters by certain purists, yet they breathe the very spirit of Chuang Tzu just as much as, for example, the famous 'butterfly passage' of chapter 2." On the other hand, chapter 33 has been often considered as intrusive, being a survey of the major movements during the "Hundred Schools of Thought" with an emphasis on the philosophy of Hui Shi. Further, A.C. Graham and other critics have subjected the text to a stylistic analysis and identified four strains of thought in the book: a) the ideas of Zhuangzi or his disciples; b) a "primitivist" strain of thinking similar to Laozi; c) a strain very strongly represented in chapters 8-11 which is attributed to the philosophy of Yang Chu; and d) a fourth strain which may be related to the philosophical school of Huang-Lao. In this spirit, Martin Palmer wrote that "trying to read Chuang Tzu sequentially is a mistake. The text is a collection, not a developing argument." The seeds of things have mysterious workings. In the water they become Break Vine, on the edges of the water they become Frog's Robe. If they sprout on the slopes they become Hill Slippers. If Hill Slippers get rich soil, they turn into Crow's Feet. The roots of Crow's Feet turn into maggots and their leaves turn into butterflies. Before long the butterflies are transformed and turn into insects that live under the stove; they look like snakes and their name is Ch'u-t'o. After a thousand days, the Ch'u-t'o insects become birds called Dried Leftover Bones. The saliva of the Dried Leftover Bones becomes Ssu-mi bugs and the Ssu-mi bugs become Vinegar Eaters. I-lo bugs are born from the Vinegar Eaters, and Huang-shuang bugs from Chiu-yu bugs. Chiu-yu bugs are born from Mou-jui bugs and Mou-jui bugs are born from Rot Grubs and Rot Grubs are born from Sheep's Groom. Sheep's Groom couples with bamboo that has not sprouted for a long while and produces Green Peace plants. Green Peace plants produce leopards and leopards produce horses and horses produce men. Men in time return again to the mysterious workings. So all creatures come out of the mysterious workings and go back into them again. Hu Shih considered Zhuangzi a Chinese forerunner of evolution. ^ Other romanizations include Zhuang Tze, Chuang Tsu, Chuang-tzu (/ˈdʒwɑːŋˈdzʌ/), Chouang-Dsi, Chuang Tse, and Chuangtze. ^ "Zhou". Random House Webster's Unabridged Dictionary. ^ "Zhuangzi". Collins English Dictionary. ^ "Chuang-tzu". Random House Webster's Unabridged Dictionary. ^ Ziporyn (2009), p. vii. ^ Horne (1917), pp. 397–398. ^ Kirkland (2004), pp. 33–34. ^ Roth (1993), pp. 56–57. ^ Palmer (1996), p. xix. ^ Schwartz (1985), p. 216. ^ Palmer (1996), p. x. ^ a b Shen, Tsing Song. (2015). Evolutionism through Chinese Eyes: Yan Fu, Ma Junwu and their Translations of Darwinian Evolutionism. ASIANetwork Exchange: A Journal for Asian Studies in the Liberal Arts. 22 (1): 49–60. ^ Watson, Burton. (1968). The Complete Works of Chuang Tzu. New York: Columbia University Press. pp. 195-196. Ames, Roger T. (1991), ‘The Mencian Concept of Ren Xing: Does it Mean Human Nature?’ in Chinese Texts and Philosophical Contexts, ed. Henry Rosemont, Jr. LaSalle, Ill.: Open Court Press. Ames, Roger T. (1998) ed. Wandering at Ease in the Zhuangzi. Albany: State University of New York Press. Bruya, Brian (translator). (1992). Zhuangzi Speaks: The Music of Nature. Princeton: Princeton University Press. ISBN 978-0-691-00882-0. Chan, Wing-Tsit (1963). A Source Book In Chinese Philosophy. USA: Princeton University Press. ISBN 0-691-01964-9. Chang, Chung-yuan (1963). Creativity and Taoism: A Study of Chinese Philosophy, Art, and Poetry. New York: Julian Press. Creel, Herrlee G. (1982). What is Taoism? : and other studies in Chinese cultural history. Chicago: University of Chicago Press. ISBN 0-226-12047-3. Hansen, Chad (2003). "The Relatively Happy Fish," Asian Philosophy 13:145-164. Horne, Charles F., ed. (1917). The Sacred Books and Early Literature of the East, Volume XII: Medieval China. New York: Parke. Kirkland, Russell (2004). Taoism: The Enduring Tradition. New York: Routledge. ISBN 978-0-415-26321-4. Merton, Thomas. (1969). The Way of Chuang Tzu. New York: New Directions. Palmer, Martin (1996). The Book of Chuang Tzu. Penguin. ISBN 978-0-14-019488-3. Roth, H. D. (1993). "Chuang tzu 莊子". In Loewe, Michael. Early Chinese Texts: A Bibliographical Guide. Berkeley: Society for the Study of Early China; Institute of East Asian Studies, University of California Berkeley. pp. 56–66. ISBN 1-55729-043-1. Schwartz, Benjamin J. (1985). The World of Thought in Ancient China. Cambridge: Belknap Press. ISBN 978-0-674-96191-3. Waltham, Clae (editor). (1971). Chuang Tzu: Genius of the Absurd. New York: Ace Books. Watson, Burton (1962). Early Chinese Literature. New York: Columbia University Press. Ziporyn, Brook (2009). Zhuangzi: The Essential Writings with Selections from Traditional Commentaries Hackett Classics Series. Hackett Publishing. ISBN 978-1-60384-435-2. Wikimedia Commons has media related to Zhuangzi.